One of the interesting trends in modern storytelling is the “side story,” in which we leave the main narrative to follow some auxiliary characters for an issue, episode or chapter. 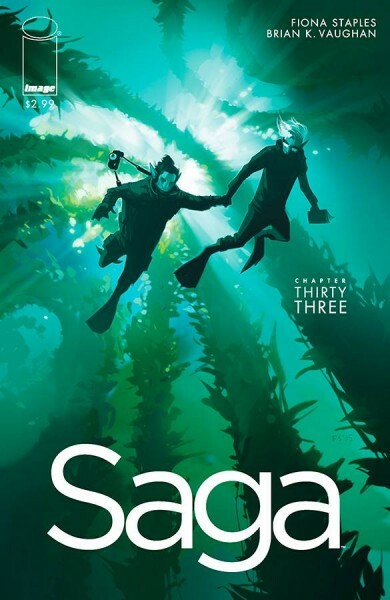 Saga has always been a series that has tried unexpected things, and has had side stories before, but Saga #33 marks the first time in which the entire issue follows Upsher and Doff, two tabloid journalists on the hunt for Alana and Marko. Brian K. Vaughan and Fiona Staples make some clever choices that test our allegiances, and the end of the issue marks the return of a fan favorite character that hasn’t been seen in many issues. SPOILERS to follow. Upsher and Doff were introduced a while back, in issue #13. They are a couple who were chasing after the story of Alana and Marko, and their crossbreed child. Their pursuit seemed to end when they were cursed by The Brand, preventing them from mentioning the story or they would risk death. However, after The Brand was killed searching for a cure for her brother, The Will (who was suffering from a near fatal wound), Upsher figures out that they can pursue the story again. Although their editor is rather unenthused about the premise, Upsher and Doff set off to find Ginny, the woman who had a flirtation with Marko in The Uncanny Valley. This leads them to an ice planet, where they met a healed The Will and Sweet Boy (The Brand’s dog-like companion), who capture Upsher and Doff, to pursue Prince Robot IV, ultimately also trying to find Alana and Marko. 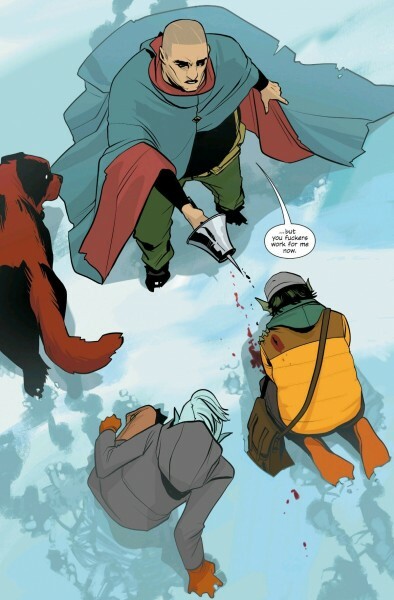 Most of Saga #33 follows Upsher and Doff, who are well characterized by Vaughan and Marko. They are not among my favorite characters in Saga due to their opportunistic chase of Alana and Marko. I also don't find them as complex as other characters in the series. It has now been years since they first tried to find Alana, Marko and Hazel. Doff himself points this out and suggests they leave things alone. Ultimately, though, the exposure the story would bring them is too tempting for them to leave it alone. This puts them in a strange place from a reader’s perspective because they are mostly sympathetic characters but they are also trying to ruin the lives of our main heroes, Alana and Marko. It's not the first time Vaughan and Staples have given us interesting antagonists for Alana and Marko. The most important development of Saga #33, which occurs at the end of the issue, is the reappearance of The Will. He was introduced early in the series, and instantly became a popular character, but he’s been sidelined because of a severe illness/injury. His return is surprising but perhaps even more surprising is his overweight appearance. It’s a subtle change but it instantly raises questions about what has happened to him. That’s a mystery that Vaughan and Stapes may or may not reveal, but it’s a major deal that The Will has returned, especially if he is again after Alana and Marko. 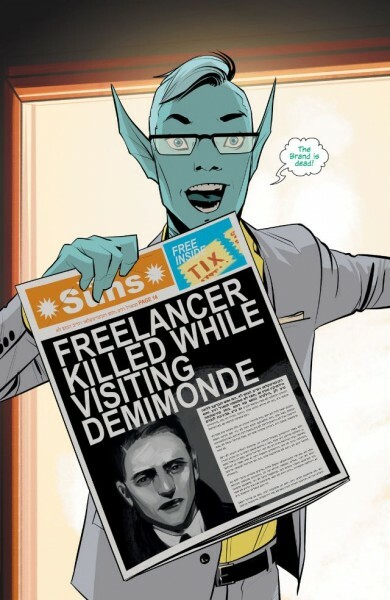 The art of Saga #33 by Fiona Staples is as always very sharp. The thing that is impressive about her work in this issue, though, is her coloring. Unlike many comic book illustrators, Staples colors her own work. There are so many different color themes in Saga #33, from the orange-red of Doff’s dark room to the golden light of Upsher and Doff’s meeting with Ginny, Staples provides a huge range of color in this issue, more than in an average Saga comic book, it seems. This isn’t a trivial part of the issue, either. The various colors Staples adds to these scenes greatly affects the feel and emotion of the panels. Altogether, Saga #33 is a good issue, though the central characters are not quite as interesting to me as the core players in this story and even some of the other supporting characters. Still, Vaughan and Staples present Upsher and Doff in such a way that it makes readers examine how they feel about those chasing Alana and Marko. The return of The Will is by far the biggest moment of Saga #33, and it’s exciting to have him back in the series. He figures to be a central part of the current arc as it progresses, and likely beyond.